Did you know dogs can learn hundreds of words in the English language? 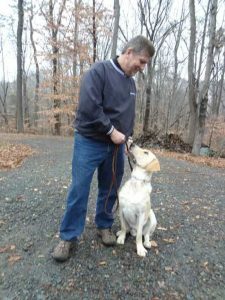 In fact, many behaviorists believe teaching commands during puppyhood actually increases their learning and ability to learn as they get older. Even if they never get to that level, they can understand your voice inflection or your tone. Try listening to the sounds dogs make. They will growl in a deep tone when they are not happy, and yelp or bark in a high pitched tone when they are pleased or excited. They will squeal when they are happy and they squeal differently when they are afraid. Barking at other animals may be different than barking at strangers. If you pay attention closely you can determine a lot about your dog by listening to the sounds he makes and correlating them to his behavior. You can use your voice inflection and tone to make it easier to communicate with your dog. Being upbeat and happy can and will encourage your dog to come, play, sit, heel or let’s go. When he does what you ask, that same tone can be used to equate how happy your are with him. What kind of tone or inflection should you use when telling your dog to down? If you answered a firmer, deeper tone you would be 100% correct. Why do you think this is so? When you ask your dog to down you are asking him to submit to you. That tone may be needed to show him that you mean what you say. Of course you would praise him when he did it. I tell all of my clients that yelling at your dog and losing emotional control does no one any good. When you see a human yelling what do you think of them? I bet you respect isn’t part of the equation. Same with dogs. You aren’t gaining respect. You may be intimidating your dog; but, you sure aren’t moving your dog to obey because he wants to.